Imtiaz Ali brings Kashmiri wedding rituals onscreen with Rockstar! Director Imtiaz Ali has gone to great lengths to make sure everything shown in Shree Ashtavinayak Cinevision and Eros International’s Rockstar is as authentic as possible. The buzz is that for the first time ever on screen, a Kashmiri Pandit wedding will be shown, with all its rituals and traditions! During the recce, Imtiaz had asked the line producer to make him meet a Kashmiri Pandit family in order to maintain authenticity. His house was located in a small Hindu settlement in Srinagar and the team went all the way to his house, sat for 3 hours with his wife over tea to understand all the nitty gritties of kashmiri weddings. Great care was taken to make sure everything that would appear on screen was completely accurate and as real as possible! They then walked to the very popular Kheer Bhawani temple, met the priest and watched his own daughter’s wedding video to have a visual understanding of the rituals. The designers Manish Malhotra and Akki Narula roamed around the streets for hours to get the traditional attire perfect to the T.
Right from the way food is served in the tram (copper plates) to the traditional Dejhor which is Kashmiri jewellery worn in the ears (symbol of a married woman) along with the shaneel fyran (velvet dress/outfit), the intricate henna pattern and the tarang (cap) the girl wears during the wedding rituals, etc, were painstakingly researched for the shoot. In fact, during the shoot, the locals who were part of the scene were given full freedom to inform Imtiaz if something was going wrong and wasn’t part of the tradition! 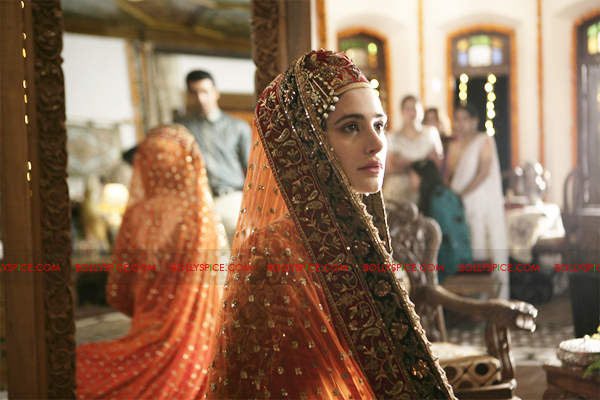 Check out Nargis’ picture from the film in Kashmiri wedding attire below!